Around Fowey. Photo by Hilary Bass Rifkin. The kids are restless, time and tempers are short, you're in London, and you all need a great escape. Forget the budget airline getaway to Spain or Portugal. Think local instead, and take an effortless train ride down to the coast of Cornwall. The weather here, as in so much of England, can be unpredictable even in the best of times, so staying somewhere that allows your kids to make like summer camp is essential. 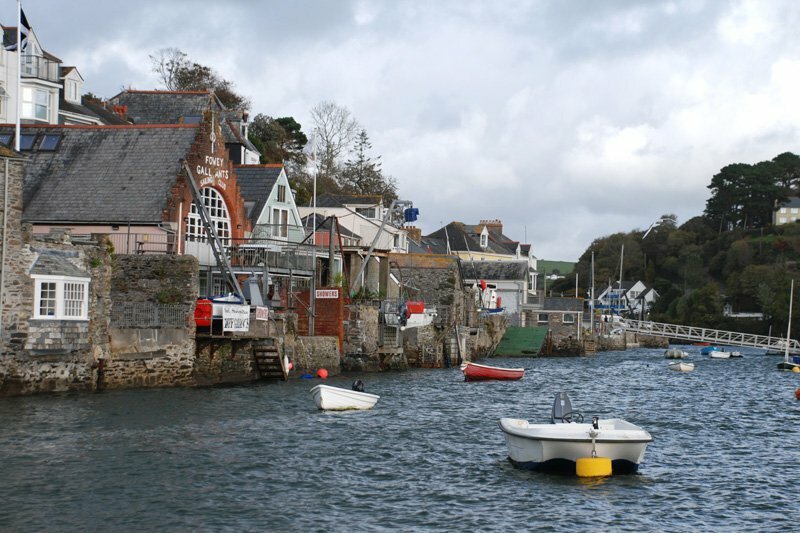 Fowey Hall in the picture-postcard town of Fowey (pronounced "foy") is the answer. At first, you may resent the trampoline blocking the view of the stormy coast. But you won't when you are trying to savor the sumptuous breakfast that your children have just hoovered. Send them out to jump and run. You won't see them for at least an hour, and they will return with ten new BFFs. An indoor pool rounds out their experience; the spa rounds out yours. A 20-minute cab ride away is Eden Project, a garden and education center built on a disused clay mine. Your budding environmentalists race from biome to biome, from garden to sculpture in a state of rapture. Don't miss the goddess resting in the woods. Do try to rock the gentle giant in the field of wheat. Closer to home and down a very steep and winding road is the town of Fowey. In the fudge shops, the bakeries, and the very relaxed chowder house, Americans will see the genesis of every last New England seaside town. On a sunny day, head to the small aquarium in town for a bucket, some bait and string, and go crabbing off the docks with your kids. If the crabs are big enough, the hotel will cook them up, but it's generally best to throw them back in for the next family to enjoy. Head back uphill at day's end, have an evening cocktail while the kids have dinner before settling down to a movie with their new band of brothers. You, on the other hand, will move on to the formal dining room for a peaceful dinner enhanced by a stunning wine list. Of course, you can eat with your children. But they won't want to. Harry Potter is showing, after all.